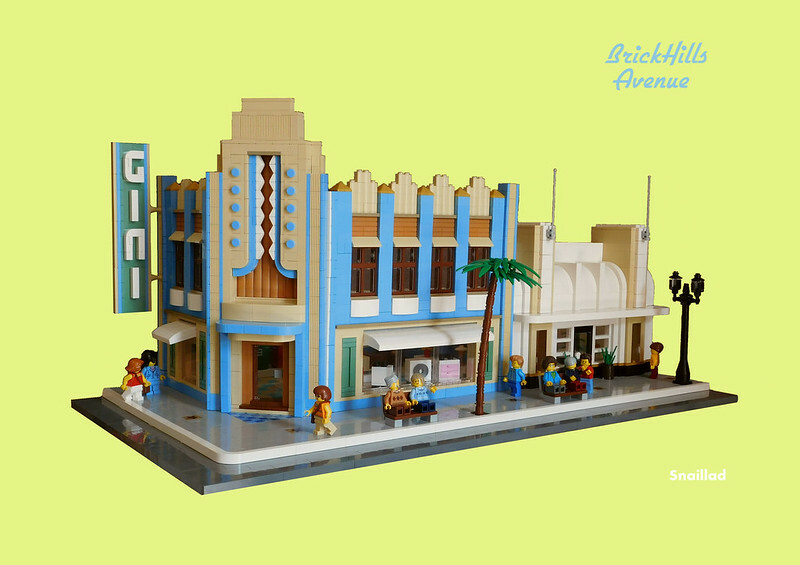 I present my newest MOC with a distinct American feel from the 1940's - Brickhills Avenue. It was inspired by a trip to Disney's Hollywood studios several years ago. I was really interested in the Art Deco/Streamline styling of some of the stores on 'Sunset Boulevard' and 'Hollywood Boulevard' and did some research to find out where they got their inspiration from. Many of these buildings are based on real one's in and around L.A, many of which are still in use today albeit with different purposes. I've set it in the early 1960's, just as the 'Walk of fame' stars we're being added to the sidewalk/pavement, also a good excuse to use some very cool Scooby-Doo 1960's hairpieces! Any questions, comments or suggestions welcomed! Fabulous job on the interiors and exteriors. Looks great! I think the palm tree needs to have some more leaves on it though. Speechless, as always. You are a master builder. Wonderful example of Art Deco. The interior details are also very nice. Nice job. The interiors are incredibly realistic. Plenty of SNOT, lovely interiors, perfect color palette. I think you've got that Art Deco/Streamlining design spot on and this is another incredible build by you. Cool build. Thanks for sharing! Another masterpiece! 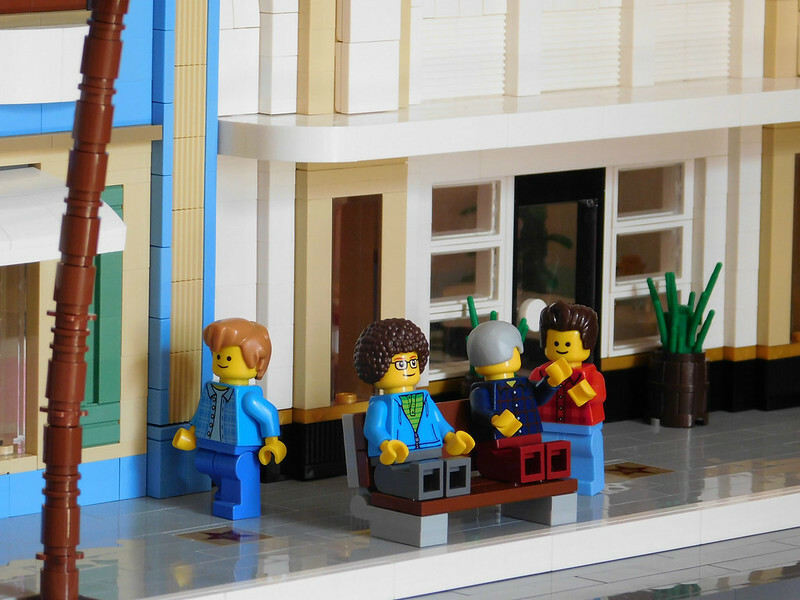 The level of detail and style you create by choosing the right bricks and colors always amazes. I'm always in awe of your buildings. They're amazingly detailed. You capture the feel of the era beautifully. 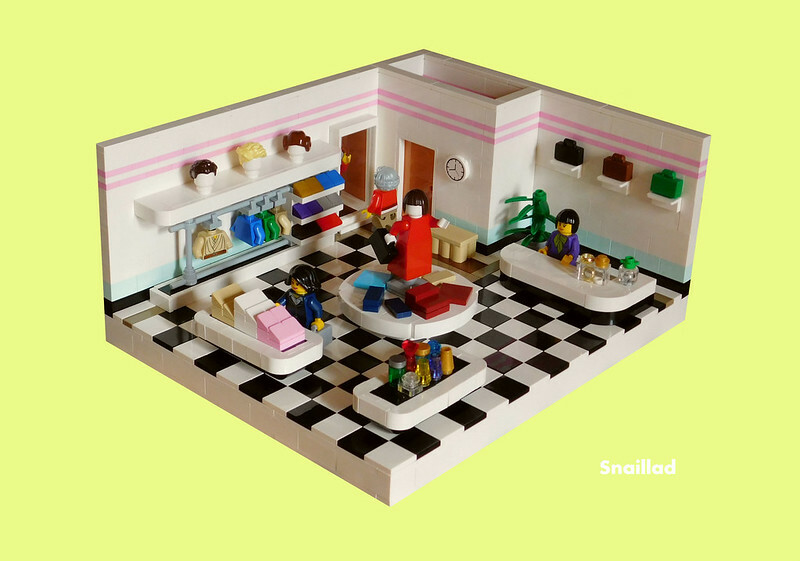 Once againe, a really nice moc from you! 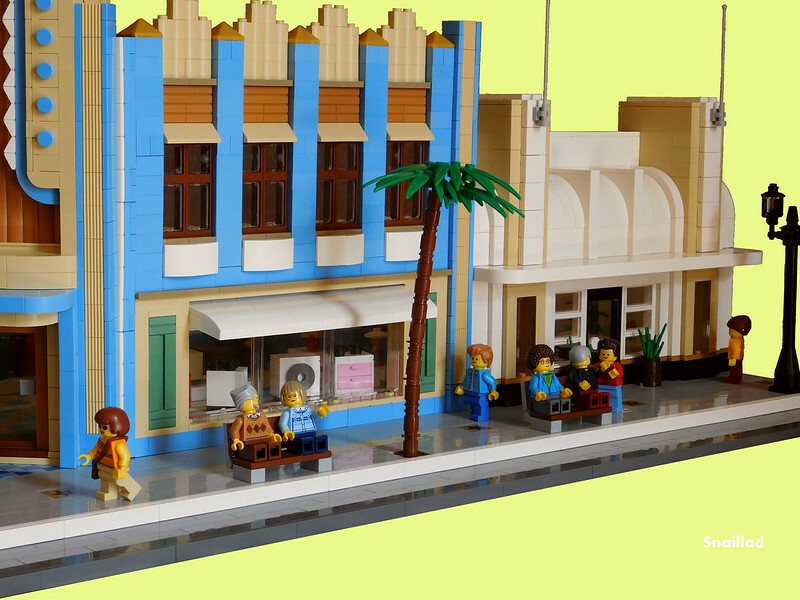 Nice color scheme, nice architectural details for thos art deco buidings, and nice choice for the minifigs wears and hairs! That looks really nice and smooth, as your style is! 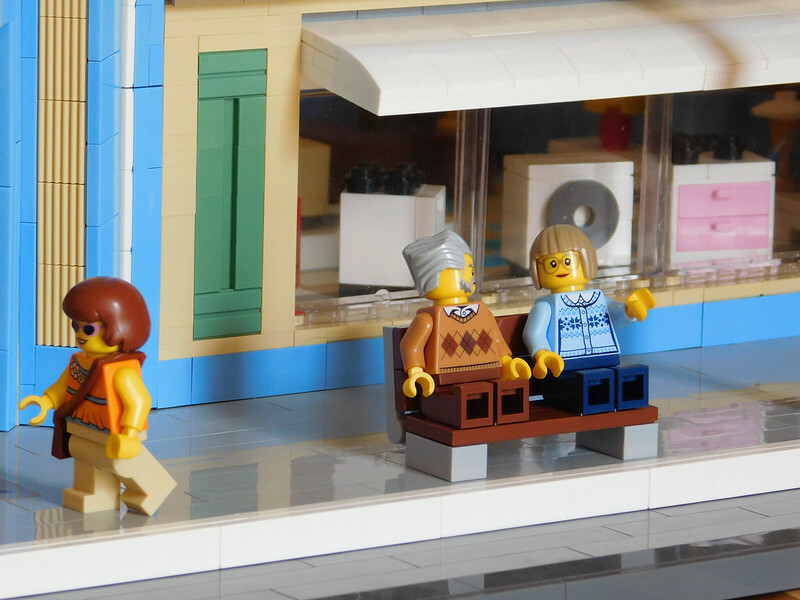 Thanks bricklover, its long overdue I also made some interiors! Thanks BrickCurve, sadly I have limited tree elements, I've seen some awesome palm tree designs but I didn't have the parts to replicate so its the best with what I had! Thank you Gongoro73, AFOLguy1970 and BrickJagger! Cheers eurotrash, it was fun to build something with plenty of colour. Although I can't say if it's true to original colour schemes, mine are taken mostly from Disney Hollywood studios! 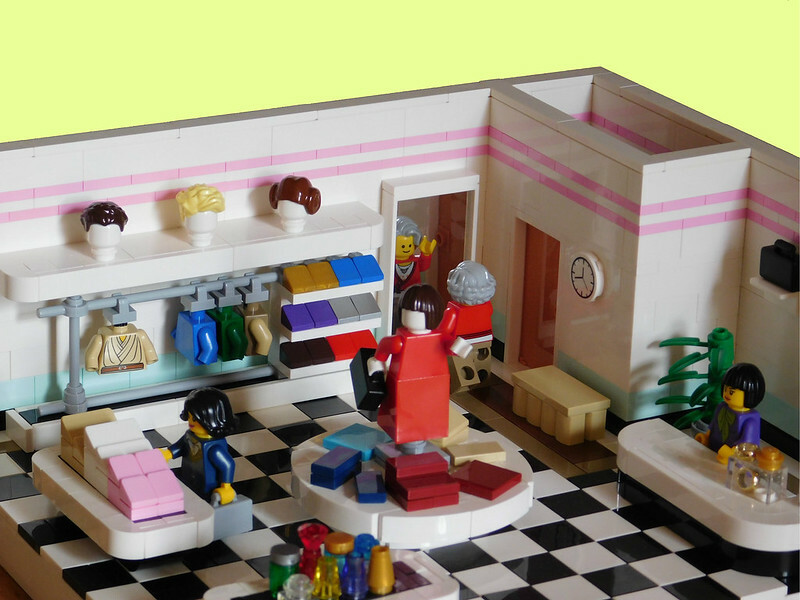 Thanks peedeejay, it may look easy but I tell you I pull my hair out trying to make MOC's that haven't been seen before! Whether that be in colour and or style. Much appreciated BlockLogo, Vindicare and alex54! Can't believe you don't work for Lego yet. You always do such great art deco! I like the contrast of older buildings set in the 1960s... gives it a great sense of time/place. The interiors are real eyecatchers - love the old-fashioned tv set in Gini's, and the clothing boutique has a nice, airy feel to it. Is there anything in the upper floor of Gini's? A beautiful build, the interior is just as stunning as that brilliant exterior. Another fantastic Art Deco style building from you! :thumbup: I especially love the outstanding SNOT sections on the facade. Excellent job!! 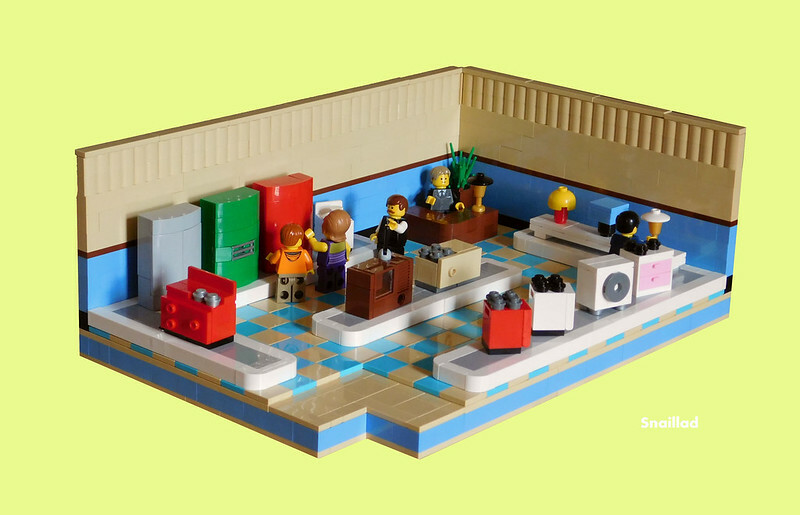 Love the detail inside the electronics shop and all of the various appliances! As usual a really nice build in this style. You have gone all out using Brick with groove in Sand Green . The shops are amazing and the whole building is a masterpiece! Very well done ...like always from you!